Our ex-pat German hosts: Dieter & Monika. 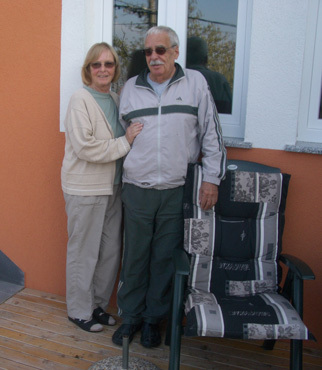 After convalescing from a nasty bug merged with waiting-out the dreaded Croatian bura winds, we finally said farewell to our generous German hosts at Senj and continued south along the Dalmatian coast. Still hacking from bronchitis and dabbing our sore noses, we were glad to be moving again. A week of near-inactivity left me with a bad case of cabin fever and my withering quads put me at risk for a knee injury. However slowly we would pedal, we'd do so happily. In addition to launching in decidedly better weather with better health, we were unexpectedly treated to safer riding conditions. The new, nearby freeway was sucking much of the traffic off of the coastal road past Senj and we practically had it to ourselves for a couple of days. For the next 60 miles the pavement was new and fresh, the road bed was wider with a hint of shoulders, and the drivers responded to the better conditions by sharing the road. The stressful riding conditions on the Istrian Peninsula and on the more-northern part of the Dalmatian coast had dissolved--we could kick-back and enjoy the journey. It hadn't been easy to build the road through these hills. But the calmer winds and sunny skies lasted only through lunch our first day out of Senj and then dark, threatening cloudbanks settled-in on top of us. Luckily the accompanying rain was strictly a night-time event and warmer gloves, not rain gear, saw us through the riding days. With this turn for the worse in the weather we were especially grateful for the timing of the better road conditions as the latest winds had us jerking around on the curves like popping corn. The road was rarely straight and anticipating the changing direction and strength of the wind on the endless bends and grades was like playing a peek-a-boo game with a child. We'd surge ahead in an unexpectedly sheltered stretch and get stalled out a minute later with a straight-on blast. Rather than be frustrated by the extra effort it required, we enjoyed the playfulness of the game. We'd traveled this road to Zadar for the first time in 2007 and knew the departure from Senj would be difficult. Scant lodging, not a sensible reconditioning program after an illness, would dictate our itinerary. The first day would dish out 2,600' in elevation gain over 40-miles. The gain and steepness would almost qualify it for a 'mountain day.' The miles and gain the second day would be lower but the head and crosswinds that whipped-up even more fiercely overnight kept the level of effort high on that day too. Our hard work the day before showed in our performance on Day 2 as we were dragging when we got to our next lodging stop. This winter garden was on the inside bend of the main road. Last year I didn't enjoy this southern journey along the mainland coast road; this year I loved it. Last year I was cranky about the unexpected hard riding; this year I anticipated it. Last year we made-do with the unusually meager market selections; this year we carried extra food to see us through the lean areas in style. Last year I begrudged the scenery for not delivering the pleasures of the typical old stone harbors; this year I enjoyed the scenery for what it was. This year I could appreciate the 1,000' high road out of Senj which gave us a close look at a different aspect of the rocky land. And it was fascinating to see hints of interesting rock forms on the first day that we thought were unique to the lands farther south. Cracking the code on finding pleasant, inexpensive lodging this year also my elevated impressions of the area. The key was to avoid looking for lodging in the center of town close to the services and instead start shopping for a place inland a half mile or mile before arriving in the village. Learning that and to buy our groceries before securing lodging decreased the stress of our usual end-of-the-day routine. As we traveled farther south the occasional rain threats diminished and our spirits were only dampened by clouds and a lot of wind. I considered it good weather for the fall though Bill longed for better. However his laments were quickly silenced by reports of freezing temperatures and a dusting of snow in London while our gauge touched 70 degrees. Even as we struggled against the resistance of our still-recovering bodies it was a simple matter to appreciate the benefits of heading south and being in lower elevations with the coming of the very changeable fall weather. The look of much of the central Croatian coastline. The relatively peaceful riding we did in too playful winds radically changed for the worse as we made our final approach into the port city of Zadar. Ironically the road narrowed as the traffic volume skyrocketed--a terrible combination on the primary access route into the city with no viable alternate roads. Instead of enjoying casual riding on new pavement we were clinging to the abrupt edge of a too-worn and raging truck route. Mixing it up with the wind was no longer fun; now it was dangerous. But like it can be hard to convince a child that the time for the game is over, the wind continued to add unwelcome distractions and challenges. We rallied all of our strength and concentration to hold our narrow track and to time pull-offs into the rare driveways and side roads for quick breaks. This road into Zadar from the northeast is certainly a candidate for one of the worst roads we repeatedly ride because of a shortage of options. 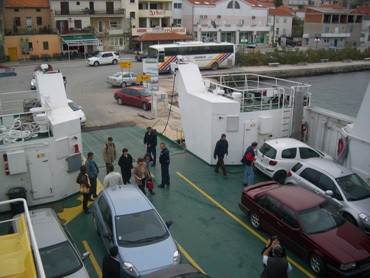 The long-awaited short-hop ferry from the island of Pasman. Bill crafted a less-efficient but decidedly less stressful southerly ride onto pair of nearby islands for our departure from Zadar a few days later. His elaborate evasive maneuver had us taking a ferry from Zadar to the nearest island, then riding about 20 miles south on it and another island linked by a bridge. The riding was capped off by an awkward hour and a half wait for a second ferry to hop back to the mainland but we easily busied ourselves on an outdoor bench doing electronic 'paperwork' chores on our PDAs. Traveling the short distance consumed much of the day but we were delighted to enjoy peaceful roads while seeing new terrain instead of adding to our gray hair count. A few years ago our Croatian adventure took us away from the touristy coast to the less-traveled eastern interior--a region deeply scarred by the 1990's Balkan wars. The numerous signs still identifying the lingering land mine hazards had a powerful effect on us at that time. It was extremely sobering to see residential areas with individual, abandoned homes taped off because of left-over, hidden explosives. It was also the year that a Dutch tourist lost a leg after stepping on a land mine in a region thought to be safe. 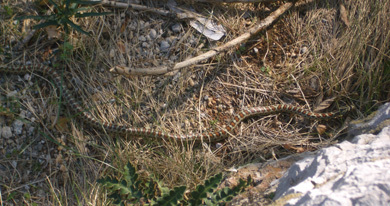 This year the only signs we saw warning of land mines were those we'd seen before outside of the large coastal city of Zadar; this year it was the lurking snakes that spooked us. In 2007 we'd read national park info boards describing the 2 types of venomous snakes in the country but the only serpentine specimens we spotted were road kill. We didn't stop to inspect those flattened snakes to determine if they were venomous but took their presence as a reminder to be vigilant. This year, 2008, became memorably different the moment I recoiled from a good-sized snake lolling in the dried grass between our lunch stop bench and my bike. I had been a single step away from planting a foot squarely on his mid-section when I spotted him. The snake that had quietly joined us for lunch. The snake calmly held its ground at the base of the rock wall as I retreated and then grabbed our camera. We watched each other as I snapped a series of photos from the safety of the wall top with him on the ground below. I wasn't willing to get close enough to his nose to sort out if he was a venomous adder or not. Regardless of the punch the snake could have packed, the sighting had Bill and I both tip-toeing more gingerly in the grass and rocks than ever before. Like when the land mine signs in the east had us settling for less privacy when peeing in the bushes in favor of more certain safety, we were more cautious the rest of this year too so as not to unexpectedly be sharing space in the bushes with a snake. And just like being rattled by the fear of stepping on a land mine in the east, the fretting about encountering a snake extended into unreasonable spaces. 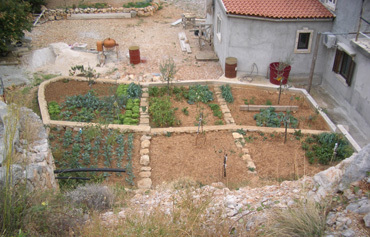 Weeks later when hiking I was still on high alert for snakes as I sheltered from a hail storm under an olive tree. My focus on the ground had me completely missing the fact that a German Shepherd was poised at shoulder level on the bank right behind me. Luckily his eagerness was for companionship and not confrontation. It was however a good reminder as to how over-vigilance for one hazard can put one at greater risk from under-attention to other hazards--something that is an issue when cycling in heavy traffic too. 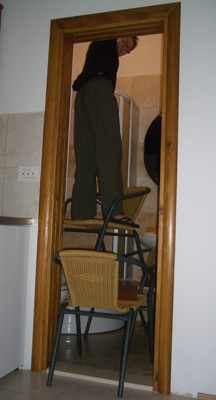 In 2007 we laid over a couple of days in the seaside town of Makarska to sit-out a forecasted fierce storm--a storm that didn't really materialize. Instead of being buffeted by strong winds and pelted by rain last year, we only dealt with showers on our fitness walks that we substituted for riding. 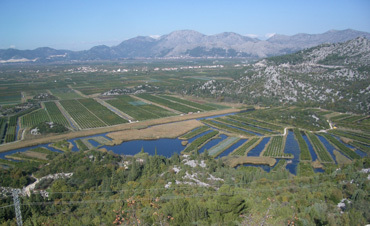 After weeks of mostly dry weather, our 2008 approach to very popular Makarska again coincided with an advancing storm. Checking the internet and TV forecasts for several days in a row told the same story: 100% chance of heavy rain on Wednesday. Even stronger headwinds on Tuesday morning convinced us a storm was on the way despite the patchy blue skies and 70 degree temperatures. We arrived at more northern Omiš a little before lunch and decided to hang it up after less than 15 miles of riding. If the winds persisted or worsened, we'd be dragging into Makarska close to sundown. 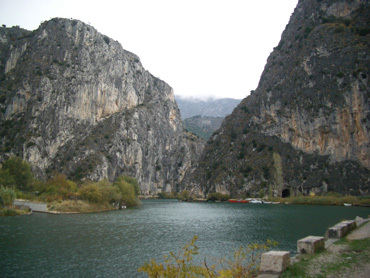 Omiš with its deep gorge and estuary had caught our eyes last year and lingering to explore hiking in the area was enticing. Plus, this wasn't just any Tuesday, this was election day in the US. We'd tossed around the idea of pausing to watch the election returns but the first results wouldn't be in until midnight our time with the last polls closing about 7 am central European time. We'd decided that checking the election results when we arose at 6:30 am would tell us all we needed to know and that we'd plan on riding that day. But as we pondered the options in the face of the storm, staying an extra night to explore the hills of a new village, indulging in a full day of TV coverage to get closure on the returns, and sitting out the tempest seemed too good to pass-up. On Tuesday evening our plan sounded even better as the weather forecast had deteriorated to include strong winds, heavy rain, and waterspouts along our coastal road--a good day not to be mixing it up with the trucks. Suddenly we were again enjoying the idea of having our own little election day party. Too bad the supermarket didn't have any no- or low-alcohol beer but we splurged on selecting a nicer but over-priced tourist apartment for our election party/storm bivouac. We'd heard that even the generally aloof top French politicians were attending an all-night party to watch the returns, so why shouldn't we? That tidbit underscored the global perspective we'd been hearing for months: that people around the world were fascinated by our elections and those in the world audience heavily favored Obama. E-mails from family members and some friends inundated by election coverage revealed election fatigue and impatience: they just wanted it to be over. Perhaps our more outsider status kept our excitement level high, as like many of the non-voting world around us, We were still excited on election day with the prospect of dramatic change in the US and a fresh start for our country abroad. On November 5th our time we were up and had the televised returns on just before the polls closed in Alaska but that was 2 hours after Obama had been declared the winner. Missing the historical announcement by 2 hours hadn't seemed catastrophic but it took hours of viewing to hear the first replay of Obama's acceptance speech and even more hours to assemble most of candidate-McCain's last speech from sound bites. But watching for hours on end allowed us to use the filler to slowly piece together some of the critical events that had shaped the campaigns--events that we'd missed due to spotty English news availability over our months of travel. The almost continuous viewing all day and all evening was what I had wanted for this day--I wanted this memorable experience to be etched in my being by as many details as possible. I didn't want it to flicker by like a sunset; I wanted it to endure. However, it had required an increasing use of the Mute button and dabbling with Sudoku puzzles to retain our sanity as trivial stories were played for the 3rd, 4th, 5th, and 6th times. 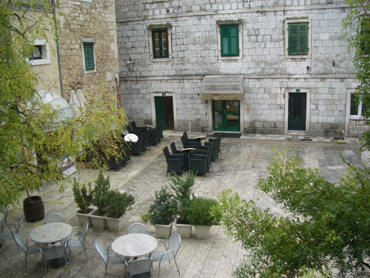 There was no election-day celebration in the square at Omiš. After more than 7 hours in front of the TV that began on what was still election day on the West Coast of the US, I dislodged myself for a walk. I stepped out into the small stone square of our Croatian village of Omiš to find no celebrating crowds as we'd seen on the news in many European cities. No doubt the people that hadn't been driven indoors by the Mediterranean siesta would have been cleared out by the rain. But we'd heard no cheers earlier and I doubt that the Croatian's cared about the US elections as much as the Europeans west of that now-invisible ideological line that divided the continent for decades. I would have loved to have shared our joy and tears in a public celebration with a crowd of strangers but as so often these years, our celebrations are in a party of 2. As I walked in silence without a soul in sight I found that the emotions of the previous 7 hours that had filled my head and heart were beginning to radiate out to my fingers and toes. I found that a deep wound in me was starting to heal--that shame of being an American abroad was dissipating. Months ago we'd been stunned by an overseas commentator's prediction that 80% of the global anti-Americanism would evaporate on election day if Obama won. I'd found that an incredible yet an intriguing prospect. More surprising, as a stranger in a strange land with no one around, I felt like what that analyst had forecasted was now true, that anti-Americanism was dropping away. I watched as I walked and the sense of dissipating shame became clearer and stronger and a peacefulness radiated through me. Of course what I was responding to was a change in me, not a change in others as I was still alone on the road. Time would tell if there was indeed a change in others but at least I now had my own experience to explain how such a shift could happen in so many, so quickly, despite a long, ugly path that had created so much global ill-will. Our travels that began in 2001 had deepened our appreciation of American values. Being immersed in European culture highlighted for us in a new way our nation's generally greater respect for individual rights and the deep support for innovation, creativity, and entrepreneurism. As the years went by, our pride in and understanding of many aspects of our US culture expanded. Unfortunately, George W. Bush's presidency and policies had simultaneously made us increasingly embarrassed to be Americans and eroded some of our confidence and pride in our culture. We'd slink around in public when abroad hoping not to be asked about our nationality. Having a president identified by some as a 'high functioning moron' was embarrassing to say the least. Over the last 8 years people had pressed us with questions we could not answer, like "Why was he re-elected?" "What were the American people thinking?" and "What is he doing, what is his reasoning?" Not only were we ashamed to be Americans under Bush, his policies had increasingly made the world less safe for us as Americans. We'd set-out in 2001 to cycle around the world but Bush's policies had instead resulted in us making numerous loops around Europe because of the escalating hostility towards Americans elsewhere. We envied those people with whom we occasionally spoke that had dual citizenship and 2 passports; we too wished we could conceal our true nationality at will. The quiet Croatian estuary where I walked on November 5. But suddenly on November 5th it changed. As I walked alone in the rain on the Croatian back road I could feel the impulse to camouflage my roots drop away. I could feel myself holding my head higher. I could imagine answering an inquiry by saying "I'm from the US" without flinching. The analyst was right: Obama being President-elect was good enough to redeem us. Never mind it would be 77 days until he was in power, our image and my pride were already skyrocketing. It was already a huge relief to know we would have an articulate, indisputably intelligent man speaking for us to the world. Additionally, I felt that another wound in our culture--racism--was being healed too. I hadn't anticipated that Obama's win would have such a potent effect on racism but watching and listening to many voters on the 4 and 5th of November gave me hope that as a nation we'd had just skipped a generation in the process of reducing bigotry. It seemed that his endorsement was already elevating the people of the US and our image abroad. I realized that I'd missed that particular potential impact of his election because I had not seen him as a black man but I'd instead only seen a bright, capable, and skilled politician on the screen. Like many of the people we saw on those hours of TV coverage that continued into the evening, we repeatedly found ourselves choking on emotion and shedding tears of joy and of relief. It was like we were being cleansed of the past and embarking on a new beginning. We were deeply moved by the sense of shared experience that we were having with other Americans and with much of the world even though we were tucked away in an old Croatian stone village on a rainy day. Seventy-four days later on January 18, 2009--2 days before Obama's inauguration--my feelings on November 5 were validated by reading that American ex-pats still abroad were experiencing exactly what had been predicted, that anti-Americanism began dropping away immediately after the election. Our last look at Croatia before the northern border with BiH. The months of tension built-up around the US presidential election was released in a flash with the decisive returns on November 5th. Next, we turned our thoughts to an older, though decidedly less potent source of tension for us: crossing into Bosnia-Herzegovina. Wanting to avoid a potentially tense situation on our first trip to Dubrovnik in southern most Croatia in 2001, we left our bikes in more northern Split for a week and took a bus to Dubrovnik. Dubrovnik is definitely a "must-see" city if one is in the region but it is cut-off from the rest of Croatia by a fragment of BiH. On the heels of the very vicious recent Balkan wars, the relations between the 2 countries was strained at best. Being quite aware of our increased vulnerability on our bikes, we just didn't want to tangle so directly with the raw emotions. But even being more anonymous by taking the bus to Dubrovnik in 2001 didn't spare us from feeling the stresses of the time. We instantly knew when we came to the border with BiH that year as the animated young crowd on the bus suddenly became hushed and still. We followed the pack behavior and were stiff and all business as the stern border guards slowly approved each passenger one-by-one. It was like a scene out of a thriller movie, including the delay as several passengers were escorted off the bus into an office. 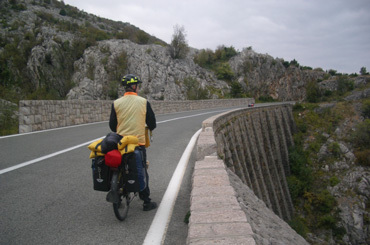 In 2007 when we biked the segment from Split to Dubrovnik, Bill skillfully avoided the 6 mile stretch of coastal road through BiH by routing us onto one of the adjacent Croatian islands. This year we decided to actually ride through this tiny bit of coast line held by BiH. I was expecting another long line at the border crossing guard house as there had been in 2001 so I postponed pulling out my passport and having that overdue sip of water until we were queued at the checkpoint. But in 2008 there were no lines and we were waved through without even a murmur, just like at any other European border. We always laugh after we are through: with our loaded bikes, nerdy affect, and graying hair we "Don't fit the profile" of who ever it is that they are looking for. I briefly had debated as to whether I should approach the border policeman with the local greeting 'Doe-bre-dan' or "Hello" and made a snap decision to wave my national flag with "Hello." We'll never know if it made a difference but I can imagine that the word choice and accent was all he needed to confirm that we weren't on his list. They were still pulling people over and trotting them into the office this year but they decided that it wasn't necessary to even establish our nationality. We joked that it was just as well not to have a stamp in our passports from an obscure place like BiH when we headed back to the US in a month as it is the border crossing where we are subjected to the most intense scrutiny of the year. Unexpectedly, we spent a night in Neum, BiH. 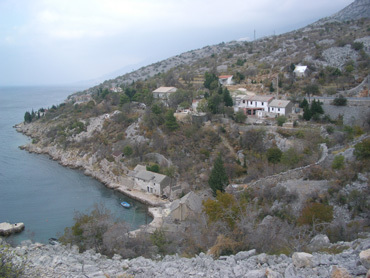 The narrow strip of BiH land that touches the sea north of Dubrovnik looked all but uninhabited on our Croatian map but Neum was as bustling as any Croatian tourist village in low season. Staying at Neum would trim our long riding day back to a more comfortable 35 miles with a robust 2,000' of elevation gain. 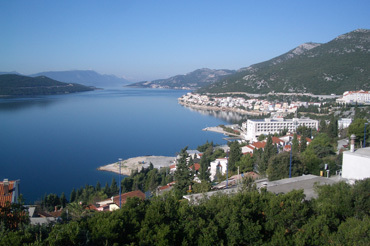 From the main road Neum looked like a tourist village in Croatia with the neat vacation apartments flanking the approach to town. The village streets themselves of this road junction town were a little sorrier however as they hadn't shed as much of their haphazard infrastructure look that is so iconic to us in eastern Europe. When Bill returned to the bikes after walking through a residential neighborhood looking for lodging, his first comment was "You can tell it is poorer here than Croatia." The first room I looked at had also underscored the 'other' look. The plain black dress and affect of the overweight, middle-aged hostess made me feel like I'd stepped back in time 100 years. Her outdoor sign advertised satellite TV and apartments but what I was shown were spare rooms furnished only with beds like a budget dormitory. Her starting price for these rooms with a communal bathroom was 40€--a price that would normally land us a lovely apartment with English on the TV and a fully equipped kitchen in Croatia. The hostess was however friendly and generous with her blend of English and German as well as her booze. We needed to share a drink of strong liquor and discuss her summer kitchen in a mix of languages before I could see the room. I quickly determined that 40€ was the going rate for the obvious private rooms and the equally spare 2 'motels' on the main road, one in which they apparently moved the single TV from room to room upon request. Luckily in his search of the side streets Bill had found an acceptable apartment for 20€ and that seemed to come with an apology for charging a premium for a single night's stay. how we changed that light bulb. We didn't have any overlapping languages with our more business-like hostess but still managed to take care of the basics plus discuss our trip a little and the fact that we were there in the wrong season (something people are frequently compelled to explain to us). Chatting with her was an entertaining reminder of just how much communication can occur if the both speakers keep talking and gesturing while recognizing the basic subject from the outset. We managed to understand that she lacked the needed ladder to replace our bathroom light bulb, that she wondered if I had indeed gotten the frig plugged in, and we negotiated to keep the bikes indoors instead of along side the house. Despite the price gouging on the main road for lodging, the generally lower price structure was evident in Neum's shops. Bread was about half of what we'd been paying in Croatia and the canned tuna was even less. I did my best to sort through the canned tuna options for our next day's lunch by guessing at the labels but finally settled on the higher saturated fat option of having cheese. The lower affluence in the country made me worry for the quality. I remembered that day years ago in Czech Republic when we gave our tuna to the cats and settled for olive oil and bread for lunch because the canned mush was wildly unpalatable. Were we in for a longer stay in BiH I'd invested the effort to evaluate the brands as I had done in each other country, but a one-day stay didn't warrant risking offense to our palates. About a month before we were scheduled to fly home our pangs from not having access to our computer were heightened by one event and then went off the scale with a second. The first new wave of pain was when we realized that we had an awkwardly long amount of time before hanging up our bikes for the season and we suddenly needed a plan that went beyond our hardcopy guide book library. We knew from past experience that the bookstores in Dubrovnik, our next major stop, wouldn't come to our aid; if only our laptop were working, then we could buy any book we needed online and download it onto our laptop. Had that been an option, we might have tossed in a quick side trip to Cypress or Morocco, but we didn't have time to both go to a major city for a guide book and still have time for a bonus trip. Instead we'd have to fill the extra time using our limited resources covering a smaller area. 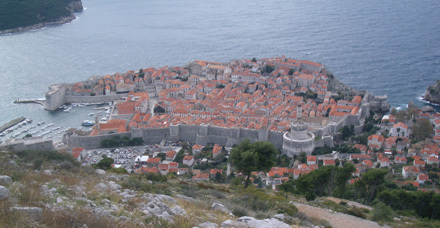 One of the views of Dubrovnik that Bill missed. Not being able to nab a guide book on a whim was irritating but what came next was worse. Had Bill the emotional capacity to "Go postal" he would have when he discovered the Catch-22 Dell had created with our new but lame laptop. Back in early September when the laptop's reliably took a precipitous drop, Bill spent dozens of hours learning to use Dell's online storage system and to store files on it. Between scores of system crashes he force-marched his way through backing-up all of our culled photos for 2008 and some tax documents onto Dell's system in case our files were lost when our laptop was repaired. He was up late many a night and we reduced our hiking outings while in the Dolomites by about 50% to generate enough time to complete this back-up process. When the laptop finally went belly-up at the end of September, we felt assured that no matter how great the inconvenience of being without our computer for several months, at least our files would be safe. But that bubble burst on November 10th when Bill finally realized that he was part way through the final 1 week window for renewing the online storage account and yet he couldn't complete the simple task. Limited internet access meant that he was working on the seemingly routine chore at the last minute and there was a catch. He had put the data into their storage system because our computer was failing but the security on their system required that the renewal be transacted from our computer. Bill spent almost all of his daylight hours for our 3 days in Dubrovnik in the 1 handy internet shop instead of seeing the sights. He spoke with 15-20 technicians over the course of about as many hours and we dropped close to $100 for internet charges, largely to use our own Skype account for the phone calls to Dell. At the end of the 3rd day a technician was finally able to crack the code and save our data. He couldn't save our account, but segued a solution nonetheless. That solution came after we'd spent our lunch time hatching a plan to go home early just to get the computer repaired and then go in through a backdoor at Dell's online storage site to capitalize on a grace period. While Bill was on this last ditch call to Dell, I had spent the afternoon on an adjacent computer accessing flight availability and cancellation fees for our 2 booked flights and a string of hotel reservations. We had even decided that if the penalty fees were too high on the cancellations that we'd split up and Bill would go home early with the computer and I'd follow 2 weeks later on our scheduled flights. Despite the welcome relief from having the storage problem solved and our data saved, we were stunned when we stepped out of the internet shop onto the dark street. After spending hours online to rework our travel plans it was startling not be starting our homeward journey in 2 days as dictated by our last-ditch online storage rescue plan but we were now back to the original plan and should be heading south on our bikes in the morning for 2 more weeks. It's amazing how stressful our seemingly simplified life can be sometimes. Just like the unexpected glitch with the online file storage system threw us into a tailspin and gobbled up time in November, an unexpected need to move all of our belongings while back in the States threw us for a loop. December, January, and February slipped by with little time for the webpage. So, here we are in mid-March having just arrived back in Europe for Touring Season #9. At last we again have the illusion of feeling in control of our time and the race to get caught-up is again on.